It’s been a bit of a monster-fest around here lately. I promise to write something about Bela Tarr, and a piece on Shinoda’s Double Suicide will follow shortly. In the meantime, let’s all enjoy the spectacle of Boris Karloff hanging out with a family (does anybody know who they are?) 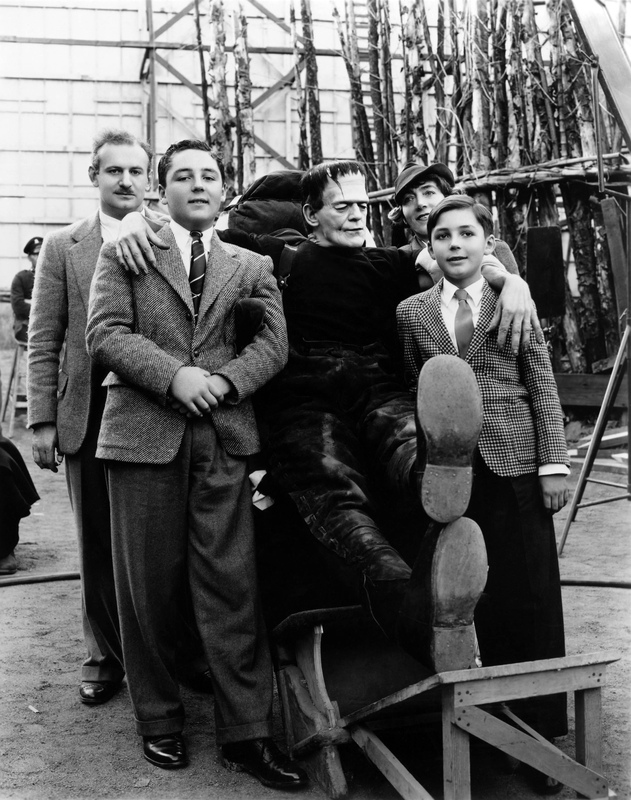 on the set of 1939’s Son of Frankenstein. I love these backstage portraits, especially when they show such an iconic figure with his guard down. So complete is Karloff’s physical performance, and so distinctive the make-up that completes the character, that it is strange to see him acting loose and cool. These shots (there’s another one I’ve seen of him taking a cup of tea and cigarette break with Colin Clive) demonstrate the totality of his onscreen presence – all it takes is a bit of slouching or an incongruous prop and all of a sudden he’s just some guy again, albeit one with some apparent cranium issues. This entry was posted in Picture of the Week and tagged Boris Karloff, candid, Frankenstein, Karloff, Monster, Son of Frankenstein, Universal by Dan North. Bookmark the permalink.